Most hobbyists know the importance of light to corals, and most also know the importance of water movement. While most aquarists should also know the importance of food to corals, many still don't feed their corals. Borneman (2002) discusses the importance of zooplankton to corals and discusses the results of many studies showing zooplankton's contribution to corals’ nutrition. The aim of this article is to reinforce this message by documenting coral feeding with pictures presented in a series of slideshows. 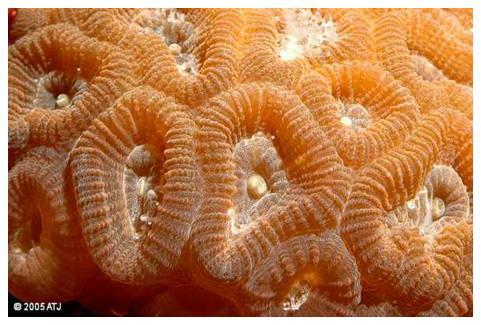 Four corals from four different families were used in this study. The corals come from the families Faviidae, Mussidae, Fungidae and Trachyphyllidae. Corals with large polyps were chosen as they were the easiest to photograph and suitable food items were readily available. I may try a similar photographic study on corals with smaller polyps in the future. This colony belongs to the Family Faviidae. 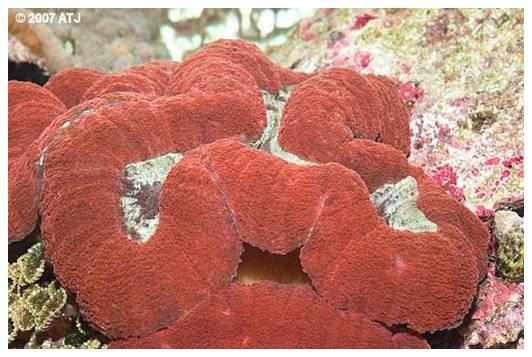 The coral studied (Figure 1 below) probably belongs to the genus Favia, but Montastrea is also a possibility. The coral was housed in a 190-liter (50 US gallons) aquarium lit by two 150-watt metal halide lamps for 11 hours per day. Supplemental lighting was provided by two fluorescent lamps for 16 hours per day. More information about the aquarium can be found here. The colony came as a hitchhiker on live rock and had been growing in the tank for nearly six years when the photographs were taken. The Lobophyllia sp. (Family Mussidae) colony shown in Figure 2 was housed in a 220-liter (60 US gallons) aquarium lit by four 36-watt fluorescent lamps for 16 hours per day. More information about the aquarium can be found here. The colony was purchased from a mail order company in May 2001 and had been in the current aquarium for two-and-a-half years at the time of the photographs. The Fungia sp. (Family Fungidae) seen in Figure 3 was housed in the same aquarium as the faviid listed above. It was purchased from a local aquarium store in April 2001 and had been in the same aquarium as the faviid since its purchase. The Trachyphyllia geoffroyi (Family Trachyphyllidae) was housed in a 200-liter (55 US gallons) aquarium lit by two 150-watt metal halide lamps. It was purchased from a local aquarium store in June 2002 and, other than a two week stint in another aquarium, had been in that aquarium since its purchase. Each coral was offered one type of food. The faviid and Lobophyllia were offered mysid shrimp. These were frozen mysids sold as "Bio-Pure®Mysis Shrimp" (Hikari Sales USA). The Fungia was offered krill (frozen "Bio-Pure®Krill" - Hikari Sales USA). The Trachyphyllia was offered flying fish roe ("Ajitsuke Tobikko" - Taiyih Seafood Enterprise Co., Ltd., Taiwan). All photographs were taken using a Nikon D70 digital SLR camera with a Nikkor 60mm f2.8 micro lens and a Nikon Speedlight SB24 electronic flash. The camera was connected to a Microsoft Windows® based notebook computer via the Nikon supplied USB cable. The control component of Nikon Capture 4.2.0/4.4.2 was used to control the camera, allowing photographs to be taken at 15-second intervals. All photographs were taken in manual mode on both the camera and flash to ensure consistent illumination. The photographs of the faviid and Trachyphyllia were all taken during the day with all lighting on. The Fungia was photographed in the evening with the metal halide lamps off, but the supplemental fluorescent lighting on. This was done to reduce the impact of the flash on the tank's other inhabitants. The Lobophyllia was photographed with just the actinic lights on in an attempt to keep the resident Chaetodon kleinii from stealing the coral's food, although I still had to be vigilant to prevent its theft. In tank circulation was switched off for the duration of each study to prevent the food items from being blown away from the corals. The time lapse photographs for each coral are shown on separate pages because of the large number of images in each sequence. There are 161 photographs of the faviid at around 50 kilobytes each. Please allow a few minutes to load all the images before playing through them. The photographs were taken between 12:48 and 1:30pm. A photograph was taken every 15 seconds for the duration of the observations, which ran for 40 minutes. Times under the photographs are in the format mm:ss and show the minutes and seconds from the start of the observations. Playing the images will display two photographs per second (30 times faster than life) and “Fast Play” will display 10 frames per second (150 times faster than life). One small mysid shrimp was placed onto the polyp (slightly to the right of center) between 0:30 and 0:45, and another between 1:15 and 1:30. Both mysids were taken into the polyp’s mouth. The polyp above the one being fed in the photographs had been fed 15 minutes earlier. None of the other polyps was fed and yet they still react to the mysids' presence, partially extending their tentacles. 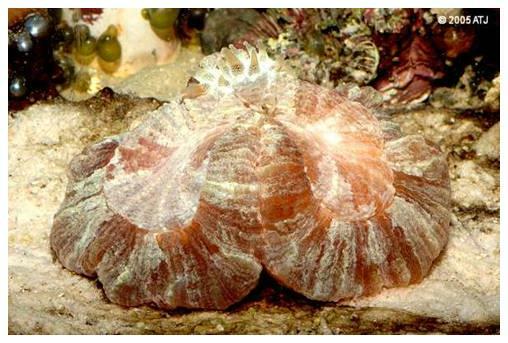 There are 132 photographs of the Lobophyllia at around 50 kilobytes each. Please allow a few minutes to load all the images before playing through them. The photographs were taken between 9:57 and 10:30pm. A photograph was taken every 15 seconds for the duration of the observations, which ran for just over 33 minutes. The times listed under the photographs are in the format mm:ss and show the minutes and seconds from the start of the observations. Playing the images will display two photographs per second (30 times faster than life) and “Fast Play” will display 10 frames per second (150 times faster than life). A few small mysid shrimp were placed onto the oral discs between 0:45 and 2:00. The polyps reacted almost immediately, manipulating the mysids into their mouths and engulfing the food. After around 20 minutes the coral had almost retracted to its normal resting state. There are 119 photographs of the Fungia at around 50 kilobytes each. Please allow a few minutes to load all the images before playing through them. The photographs were taken between 8:37 and 9:09pm after the metal halide lights were off, but while the supplemental fluorescent lights were still on. A photograph was taken every 15 seconds for the duration of the observations, which ran for 29 minutes and 30 seconds. Times displayed under the photographs are in the format mm:ss and show the minutes and seconds from the start of the observations. Playing the images will display two photographs per second (30 times faster than life) and “Fast Play” will display 10 frames per second (150 times faster than life). One krill was placed toward the outside of the oral disk (closest to the camera) between 0:15 and 0:30, and a small piece of krill fell onto the edge of the oral disk (right side) at the same time. Both the whole krill and the piece were toward the polyp's mouth, and were engulfed. There are 161 photographs of the Trachyphyllia at around 50 kilobytes each. Please allow a few minutes to load all the images before playing through them. The photographs were taken between 10:12 and 10:53am with the metal halide lights on. A photograph was taken every 15 seconds for the duration of the observations, which ran for 40 minutes. Times displayed under the photographs are in the format mm:ss and show the minutes and seconds from the start of the observations. Playing the images will display two photographs per second (30 times faster than life) and “Fast Play” will display 10 frames per second (150 times faster than life). Multiple flying fish roe was dropped onto the oral disk between 00:30 and 00:45 and were engulfed by the coral's mouth. All four corals showed appropriate feeding responses when presented with food. All used their tentacles and other structures to manipulate the food items to their open mouth(s). Each coral also ingested the food items into their gastrovascular cavities. The feeding responses occurred even though the food was presented with the tank lights on and the circulation pumps off. 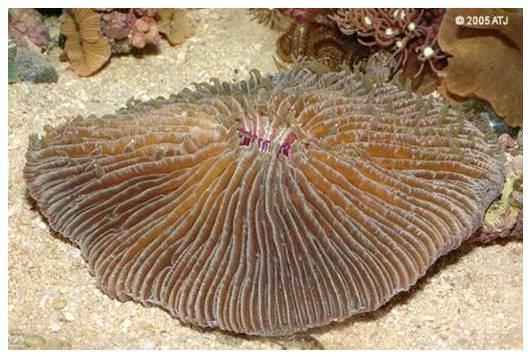 At the time that the food was placed onto the corals' oral discs, none of the corals had its tentacles extended to any great extent except the Fungia, which showed normal daytime tentacular extension. Levy et al (2001) found that Favia favus extended their tentacles in response to high flow and/or low light regardless of the presence of prey items. My own observations are consistent with these findings, including the subject corals, which did extend their tentacles with the lights out and the tank’s circulation on, as do wild populations of similar corals. Figures 5 and 6 show a wild faviid colony and the subject Fungia with their tentacles extended at night. Figure 5: A faviid colony on the Great Barrier Reef with its tentacles extended at night (low light and normal flow conditions). Figure 6: The subject Fungia sp. with its tentacles extended under low light and normal flow conditions. In this study with high light and almost no flow, the coral’s tentacles were not extended. The presence of food items, however, still induced a feeding response and some polyps that were not fed extended their tentacles. It would be interesting to determine whether the light level and/or flow rates affects the corals’ feeding response, although the study's aim of getting the corals to feed was achieved. The photographic sequences show the feeding responses of four different corals from four different families. 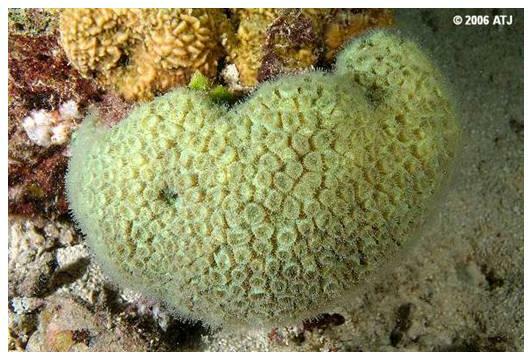 All corals were fed simply by placing food items onto their oral disc. This shows how easy it is for aquarists to feed their corals. Borneman, E.H. 2002. The Food of Reefs, Part 4: Zooplankton. Reefkeeping Magazine. 1(12). Levy, O., Mizrahi, L., Chadwick-Furman, N.E. and Achituv, Y. 2001. Factors Controlling the Expansion Behavior of Favia favus (Cnidaria: Scleractinia): Effects of Light, Flow and Planktonic Prey. Biol. Bull. 200 (2):118-126.